One of the biggest changes I'd noticed in my skin in those first few months of motherhood, was general signs of fatigue, a few unsightly blemishes around my forehead, nose and chin and a lot more excess oil than I was used to. I wanted to get back into a routine and started with reintroducing double cleansing, using key treatments and products to target my skin concerns. I wanted to keep things simple and use only the necessary products my skin needed on a daily basis and liked the idea of using a specific range of products that work together, so I started using three key products from the Vichy Normaderm range. On makeup days I've been using the Vichy Normaderm 3-in-1 Micellar Solution for a pre-cleanse step to remove my makeup; I use 2-3 cotton pads with a generous helping of the micellar solution on my face and neck, before I follow on with cream and balm cleansers. Personally, I'm not a fan of makeup wipes and find a micellar water a much better option for that first initial makeup removal before a using your cleansers. For years I have used the same micellar waters from the same brands and I wanted to try something new, as I wasn't as wowed by my old favourites anymore. The Vichy Normaderm 3-in-1 Micellar Solution has a gentle formula enriched with Zinc and Vichy Thermal Spa Water. It's Hypoallergenic and free from Parabens, Ethyl Alcohol, Colourants and Soap, so no unnecessary filler ingredients and it has been tailored for sensitive and blemish prone skin. It does the job nicely and isn't too badly priced at £11 - £12 depending on the retailer for a 200ml bottle; you can currently pick it up for as little as £8 on the Escentual.com website. The Vichy Normaderm Purifying Astringent Lotion has turned out to be one of the best Vichy products I have tried, and I have tried quite a lot of Vichy products over the years. It is not only one of the best toning lotions I have come across but a slightly cheaper dupe for a favourite toner of mine from Origins (check out my review of the Origins United State Balancing Tonic). It's a 3-in-1 solution which works with blemish prone skin and uses a formula with Salicylic Acid (concentrated at 0.5%), Totarol, which is a fab new purifying ingredient which helps to reduce acne and the bacteria responsible for acne, and Eperuline, which works to soothe and reduce inflammation. I use one generously soaked cotton pad for my face and neck and continued use has definitely shown a huge improvement in the health of my skin, leaving my skin clearer, fresher and those pesky flare-ups are well under control, as well as holding back any unwanted excess oil. This is a product everyone skincare fan needs to try; a 200ml bottle will cost you roughly £12 depending on the retailer, although you can currently pick it up for just £8 at Escentual.com! Last but not least and a nifty little product I've found a must-have in my routine for battling any unwanted blemishes is the Vichy Normaderm Hyaluspot, which is an anti-imperfection targeted care treatment. It contains Salicylic Acid (1.5%) and Lipo Hydroxy Acid (0.5%), which together work to draw out impurities with an antibacterial formula. There's also Hyaluronic Acid in there (1%) which helps to ensure skin doesn't become dry or damaged from blemishes, helping to soothe skin and provide a protective layer to aid the healing process. It's advised to use Hyaluspot over a 48 hour period to target a blemish, which is applied using a metal tip and is gel-like in consistency, so feels cooling on the skin which can be a big help when your skin is sore and hot from blemishes. I tend to use this most around my forehead, nose and chin and find it works really well in reducing the appearance of blemishes and helping them to heal and ultimately, disappear. A 15ml tube will usually cost you £10.50 depending on the retailer, but again you can find this one reduced to just £7 at Escentual.com. 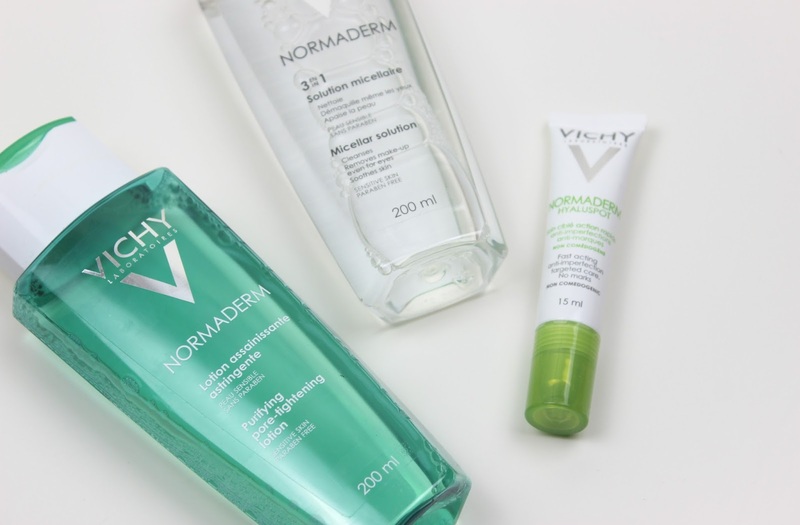 The Vichy Normaderm range is wonderful for tackling blemishes and excess oil, with products that are marketed as suitable for even the most sensitive of skin types (although as always, best to do a patch test if you want to be sure!). The range is reasonably priced for an effective skincare brand like Vichy and the products speak for themselves in the benefits they show. Available at www.boots.com, www.escentual.com and www.feelunique.com. ive heard so much about the toning lotion, I need it in my life! I love Vichy skincare and as I'm very dry I use the Thermal Aqualia range. I do though use the Hyluaspot which is fantastic. I have also passed this blog post to my daughter who does have acnaeic skin. I always try and buy my skincare on offer too as you can save a lot of money, plus it means you can buy higher quality but still stay in budget.